History Museum (Flett Events Theatre), London. Be sure to see our UKOTA STUDENT CONFERENCE VIDEO ON OUR YOUTUBE CHANNEL HERE! Alastair Pinkerton (University of London) and Dr Matt Benwell (Newcastle University). The academics then used their Overseas Territory specialist knowledge to lead a discussion on the themes coming out of the students’ original film work. 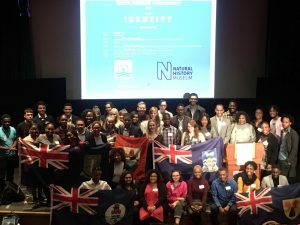 The Natural History Museum hosts gave a talk highlighting the vast range of exhibits and specimens held at the museum from UK Overseas Territories across the globe. The final speaker was Jawara Alleyne, fashion designer from the Cayman Islands, who talked to the audience about his exhibition the Cayman Islands National Gallery and how identity is a key theme in his work. Jawara was able to inspire students to follow their passion and think about how identity comes into fashion and their everyday lives. In afternoon breakout sessions, students were given the opportunity to tour the museum to see artefacts relating to their various Overseas Territories. Botanists from the museum drew the analogy with UK Overseas Territories students, by identifying seemingly different and unique flora and fauna from across the territories yet related to one another through the same genetic classification. The current UKOTA Chair Eric Bush, Cayman Islands Representative in the UK said: “We were delighted to be host the important UKOTA students conference, where the future generation of Overseas Territory citizens get to meet, interact and share areas of common interest and celebrate differences. We are particularly grateful to the prestigious Natural History Museum for generously hosting the event. The museum offers both fantastic facilities and a genuine insight into the various Overseas Territories, seen through the enormous collection of exhibits gathered from around the globe. I was extremely impressed with the calibre of the students and was very happy with the portrayal of Cayman and it’s people at the film festival.” Dr Mark Carine, Principal Curator in Charge of the Algae, Fungi and Plants Division remarked: “We are very pleased and excited to be working with the UK Overseas Territories and their students and to have had the opportunity to discuss the huge and important collections gathered from around the world over the centuries. We were so impressed by how confident and engaged the students were, and this kind of event is extremely valuable to the Museum.”.